A single day of racing is tough, but imagine stacking a series of those maximal efforts together for six or more days in a row. This significantly ups the ante, doesn’t it? During a stage race, you can’t just be done with it and go home when you finish for the day. Instead, you’ve got to distribute your ‘A’ game over the span of a week or more. For instance, the seven-day Marathon des Sables pits the runner against the sand and searing heat of the Sahara Desert. The Desert RATS does the same in the deserts of the Colorado Plateau. Participants of the six-day TransRockies Run deal with the lung-sucking altitude of the Colorado Rockies. Seven-day Gore-Tex TransAlpine-Run competitors contend with hair-raisingly steep and exposed European mountain slopes. Athletes at the six-stage The Coastal Challenge have to contend with Costa Rica’s tropical environment. Events like the 500-kilometer long Vol State Road Race, 260-mile Race Across Georgia or the quintessential example of multi-day racing extremity, the Trans-America Footrace, require competitors to run across states or from coast to coast by covering ultra distances daily, on asphalt, for up to two months straight. Though each stage race has its own set of specific demands, there are some key commonalities that can be addressed during your preparation. My introduction to multi-day racing was at the 1997 Mugu 50/50 near Oxnard, California. The low-key event required runners to cover 50 mountainous miles on day one and follow that the next morning with a similarly rugged 50k. The first day’s effort went well as I was rested and excited to explore new trails and vistas in the Santa Monica Mountains. However, the exertion of nearly 11 trail hours caught up with me in the form of stiff calves, burnt quads, and being just plain spent. As I stood on the starting line of the 50k the next day looking up at Mugu Peak and the Backbone Trail’s steep, winding pathway, I could tell the energetic magic of the first day was gone. I turned to friend and race director Chris Scott and asked him how I was supposed to run 31 more miles. He smiled, pointed at the mountains and advised, “Don’t worry Ian. All you need to do is go that way. You’ll loosen up and you’ll remember how to run.” In my case it was trial by fire. Though I survived and completed both events, I was woefully unprepared. I could have used some helpful advice. Here’s what I’ve learned that might help you prepare for your next multi-day experience. These workouts make you a stronger runner, build your confidence, and become race-day habit forming. A fast-finish long run can be added into the back-to-back (-to-back) long-run equation to emulate tough race-day efforts. “It’s important to simulate in-race stresses without overworking yourself in training,” says Eric Senseman, a coach at Good Sense Running and who, along with partner Brian Condon, won the 2015 TransRockies six-day open men’s race. 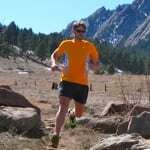 “For example, I might run 18 miles at a moderate effort on the first day, a 20-mile run with a some faster running in the middle or end on the second day, and then a 15-mile run at a taxing finishing effort on the third day–all on similar terrain as the upcoming stage race.” Just as the name implies, the goal is to finish fast or with a high level of perceived effort. The workout begins at normal long-run pace but the effort and/or pace is increased toward the end. For ‘newbies’ or during early season training, the fast-finish portion can range from two to three miles. For more experienced runners and peak-season outings, the fast finish can increase to as much as eight to 10 miles. Six-plus-day events or races with multiple ultra legs aren’t for everyone. Many races acknowledge this on their websites by strongly recommending that participants have experience functioning under adverse conditions. Ultramarathons compress into a single day the body- and mind-bending challenges a multi-day race can present. The benefit of ultra training includes relatively high training volume, refining an effective race-day fueling routine, and mentally dealing with long days on the trail or road—components necessary for a successful multi-day finish. Use the daily distances of the stage race to determine the length of the preparatory ultra. For example, an athlete preparing for a stage race with sub-ultra distances (like TransRockies) should endeavor to complete a 50k, while those training for events that have ultra-distanced legs (like Marathon des Sables or the 3 Days of Syllamo) should choose a 50 mile. Those new to the multi-day scene should select shorter events like the TransRockies RUN3 (21-mile, 14-mile and 24-mile legs) or a timed event, like the Across the Years Footraces or 3 Days at the Fair, where a runner may ‘go as they please’ over the span of a few days to assess their fitness, confidence, and desire before moving up to more complex and committing stage-race adventures. Those who are reluctant to test their mettle for the first time in a race-like environment can experiment instead with a laid-back version of stage racing. These supported ‘choose your own adventures,’ like Oregon’s Momentum River Expeditions’ three-day Rogue River running trips or Andes Adventures’ Peru, Patagonia, or Andean treks vary in difficulty and amenities. Piggybacking long runs has proven effective for athletes preparing for stage races as it mimics amassing stage-race fatigue. Stephanie Howe, a two-time TransRockies finisher and coach with a PhD in Exercise Physiology and Nutrition, calls these “cluster runs.” “After work on Friday I’d do one to two hours, then Saturday morning another three to four hours, and then on Sunday two to three hours,” she says. “By the time I got to Sunday I’d be fried, but it gave me confidence that I could run on tired legs.” Space your back-to-back sessions two to three weeks apart to allow for proper recovery. It is important to slowly progress into these workouts, especially for those inexperienced with high mileage, by starting with relatively short back-to-backs during the pre-season months and building on those as the event approaches. The table below uses the above training components and provides a suggested structure for an ideal multi-day stage race lead-in. Coach’s Note: Depending on the athlete’s experience, age, injury history, and goals, the last eight to 10 weeks of the schedule can be shifted to allow for more or less recovery after the earlier ultra and between the tough back-to-back (-to-back) long runs. Address race-specific challenges early on in the training cycle. It goes without saying—terrain and environmental specificity must be accounted for in your training build up. Acclimate for heat or altitude. Practice on mountainous terrain with trekking poles. Run with your teammate. Run and hike with the exact pack, clothing, and shoes you will wear during the race. Ensure your gear functions properly in the sand, mud, water, and/or snow. Setting out to finish a multi-day race can be a formidable test of one’s will and endurance. However, realistic, specific, and properly scheduled training will grant you the fitness and confidence to tackle every leg of the event as solidly as the first. Stay tuned for next month’s installment on multi-day race strategy and between-stage recovery techniques. Have you run a multi-day stage race? If so, how did you fine tune your training for its rigors? If you were to do another, how would you change your training, knowing what you know now? What similarities and differences have you found between typical ultramarathon and multi-day stage racing? Lots of good advice in here! During peak training for the Grand to Grand Ultra self-supported stage race (which I did in 2012 and 2014), in addition to weekend back-to-backs, I incorporated two-a-days at least once midweek. Each outing during that day would only be about 60 – 90 minutes (all I had time for) but I found it more effective than doing a single 2 – 3 hour outing for that day. The morning run would be a harder effort with some speed and/or hill work. Then the afternoon outing would be a combo of easy-pace running and hiking, sometimes with a weighted vest or pack to simulate pack training, and it would be a mellow effort to cultivate patience and acclimate to heat. are we talking actual multi-day races too or just races? Great article!!! Thanks so much. I was wondering where to find the mentioned installment on multi-day race strategy and between-stage recovery techniques?